Syria’s regime has fired Scud missiles on its own people for the first time in a sign of its increasing “desperation” to crush the rebellion. Syria’s regime has fired at least six Scud missiles on rebels, dramatically escalating the conflict. In a significant escalation, Western officials said forces loyal to the regime had fired at least six of the Russian-designed ballistic missiles on rebel targets. It means that President Bashar al-Assad has now used every weapon in his arsenal, short of a chemical attack, in an attempt to end the 21-month uprising. A Foreign Office spokesman said reports indicated that the first Scud was launched on Monday and that more had been fired since. Nato confirmed Wednesday night that surveillance had detected the launch of a number of missiles in Syria this week. “Allied intelligence, surveillance and reconnaissance assets have detected the launch of a number of unguided, short-range ballistic missiles inside Syria this week. Trajectory and distance travelled indicate they were Scud-type missiles,” the Nato official said. Scud missiles are medium-range weapons and notoriously inaccurate. Muammar Gaddafi, the Libyan dictator, used a Scud missile against rebels in Benghazi last year. The last significant use in warfare was by Saddam Hussein in the Gulf conflict of 1991, including an attack on Tel Aviv. Explanations for the deployment of the weapons varied from “ranging shots” for future chemical weapons attacks, to targeted acts of terror to quell the advancing insurgency. “The most likely explanation is that it indicates the diminishing capability of the regime’s air force to hit rebel areas, either because they are running out of pilots or the rebel air defences are doing too much damage,” said Benjamin Barry, a weapons expert at the International Institute of Strategic Studies, a London think tank. Western officials have warned the Syrian regime that a chemical weapons attack could provoke military intervention to remove Mr Assad. It is believed Syria had at least 48 Scud missiles at the outset of the crisis, meaning more than 10 per cent of its entire arsenal has now been used. “The total [fired] is is probably north of six now,” a US official told the New York Times. The news emerged as 114 countries held a summit in Morocco on Wednesday to recognise the Syrian Opposition Coalition as the legitimate representative of the Syrian people, a move that could pave the way for arming the rebels. The coalition won the recognition of more than 100 countries. Speaking at the meeting, William Hague, the Foreign Secretary, demanded greater “practical” support for the Syrian opposition. He said Britain still wanted to see a negotiated transition of power from Mr Assad but for the first time declared that the UK would not limit the scope of its efforts to ensure Syrians were defended from government attack. Intelligence reports indicating that the regime was prepared to use chemical weapons would provoke a tough response, he indicated. “We do not rule out any option to save lives. The Assad regime should not doubt our resolve, or miscalculate how we would react to any use of chemical or biological weapons against the Syrian people,” he said. Mr Hague said British aid was being stepped up to provide equipment to sustain opposition areas, including communications equipment, electricity generator and water purification systems. Technical experts from a stabilisation team had been deployed to nearby countries. Laurent Fabius, the French foreign minister, said the opposition would need to build a military framework to safeguard against the rise of extremists linked to al-Qaeda before it was granted military aid. In the final communiqué, more than 100 countries recognised a new Syrian opposition coalition, opening the way for greater humanitarian assistance to the forces fighting Bashar Assad and possibly even military aid, Mr Fabius said. Qatar has called for opposition allies to provide surface-to-air missiles to rebels to stop aerial attacks by the regime. Casualties were reported on Wednesday night at the Syrian ministry of interior after a series of car bombs exploded at the entrance to its building in Damascus. Two separate explosions were also heard in the capital on Wednesday as a rebel advance moved towards the heart of the regime stronghold. NAZARETH, (PIC)– Hebrew media sources revealed that the diplomatic relations between Poland and Israel are witnessing tension because of the settlement policies pursued by the Israeli authorities in the occupied Palestinian territories. Haaretz newspaper reported in its Wednesday edition, that the Polish Deputy Foreign Minister has refused to meet the Israeli ambassador in Warsaw, in protest at the destruction of Palestinian cisterns in the West Bank, which had been recently repaired by a Polish volunteer organization, by Israel’s Civil Administration. The paper described the relationships between Poland and Israel as “extremely tense” because of the Israeli policies of displacing and expelling the Palestinian population from their land in order to seize it. A Polish organization had funded the restoration works on a number of water wells in the occupied West Bank, but the occupation authorities have demolished them, pushing the Polish Foreign Ministry to submit an official protest to the Israeli government, through its ambassador in Warsaw. Haaretz confirmed that the Polish foreign ministry will demand the European Union to discuss the issue of the Israeli demolition policy for water wells in the Palestinian territories, during its next meeting. Dr. Mustafa Barghouthi, secretary-general of the Palestinian National Initiative, stated that the Israeli army’s invasion of the West Bank village of Ni’lin, near the central West Bank city of Ramallah, and the use of live ammunition against the civilians, is a direct implementation of statements made by senior Israeli government officials. Dr. Barghouthi’s statements came after Israeli soldiers invaded, on Tuesday at night, Ni’lin village, and shot two residents identified as Mohammad Hazem Khawaja, 18, and Khalil Srour, 18. Khawaja was shot, by a rubber-coated metal bullet to the head, while Srour was shot with a live round in the leg. The Palestinian official said that the latest violation is a direct implementation of statements made by the Israeli Interior Minister, Elie Yishai, Israel’s Foreign Minister, Avigdor Lieberman, and Kadima Party head, Shaul Mofaz, who called on the Israeli army to use live ammunition in countering Palestinian protesters holing nonviolent protests against the Annexation Wall and settlement in the West Bank. The Israeli officials said that the army should respond more firmly to the ongoing nonviolent and popular protests, also attended by Israeli and international peace activists. Visiting the wounded at the Palestine Medical Compound in Ramallah, Dr. Barghouthi said that what happened in Ni’lin is an implementation of an illegitimate Israeli policy that legitimizes crimes against unarmed Palestinians. He also said that the excessive use of force carried out by the army, and Israel’s ongoing assaults and violations against the Palestinians, their lands and property, will never deter the Palestinians from remaining determined to continue their nonviolent popular struggle against this brutal occupation, Israel’s Apartheid Wall, and Israel’s illegal settlements. The Pentagon notified Congress it wants to sell Israel as many as 6,900 tail kits used to convert free-fall bombs into satellite-guided ordnance, including weapons capable of penetrating hardened targets. The proposed deal to resupply the Israeli Air Force with bombs, tail kits, fuses and logistical support would be valued at as much as $647 million, according to a statement yesterday from the Defense Security Cooperation Agency. The all-weather satellite-guided Joint Direct Attack Munition, or JDAM, tail kits are made by Boeing Co. (BA) Bombs delivered this way are among the most precise weapons in the U.S. and Israeli arsenal. They can be dropped by F-15 and F-16 fighter jets. The proposed sale includes 1,725 JDAM tail kits with BLU-109 bombs, which are 2,000-pound, hard-target penetrators. The BLU-109 is a so-called bunker buster. The bomb is designed to “defeat an enemy’s most critical and hardened targets,” such as protected weapons storage sites, and penetrate as much as six feet of reinforced concrete, according to a U.S. Air Force fact sheet. The new order in part could be driven by a need to resupply Israel for the bombs dropped during last month’s strike in Gaza to stop Hamas rocket attacks, said Jeff White, a military analyst with the Washington Institute for Near East Policy. Underground Targets “Hamas and the other groups had lots of underground targets that were attacked,” White said in an e-mail statement. The additional weapons “could be an effort to give the Israeli Air Force a capability for more extended or more extensive air campaigns than before.” The weapons aren’t “suitable for the really deep underground facilities,” while good for command posts, aircraft shelters and air defense facilities, he said. The move “does not appear intended to transfer any new capability that Israel could use against the most hardened sites of Iran’s nuclear program,” Kenneth Katzman, a Middle East analyst for the non-partisan Congressional Research Service, said in an e-mailed statement. The order, which Congress has 30 days to review before it automatically goes into effect, includes 3,450 GBU-39 Small Diameter Bombs, a 250-pound weapon the U.S. Air Force developed to minimize non-combatant injuries and deaths near a target. Small-Diameter Bombs It’s designed to penetrate three feet of reinforced concrete and can be launched more than 60 nautical miles from a target, according to a fact sheet from Chicago-based Boeing. The U.S. has sold the weapons to Israel previously. The small-diameter bombs could be used “in built-up areas like Gaza and parts of southern Lebanon where Israel’s enemies mix their forces in with the civilian population,” White said. Other contractors involved the potential sale include Arlington, Virginia-based Alliant Techsystems Inc. (ATK), Raytheon Co. (RTN)’s Raytheon Missile Systems of Tucson, Arizona, and Cincinnati, Ohio-based KDI Precision Products Inc. The wind funnelled through the valley, bringing with it a deadening cold that swept into the windowless huts. The family was huddled together near the paraffin stove. In the corner a child was coughing. “Snow is coming,” said Ammar, the 14-year-old man of the house. His father is in Syria and, as far as he knew, is still alive. “But I miss him so much. I cannot speak to him and that hurts me greatly,” Ammar said. Six months ago the boy crossed into Lebanon with his mother, three young sisters and a baby brother. They came by night to evade the snipers and landmines. The family – who asked to remain anonymous – fled from Homs after their home was destroyed by government shelling. I met them in Arsal, a bleak Lebanese village on the border with Syria where they live crowded into a single room constructed from breeze blocks. It serves as kitchen, bathroom and sleeping quarters. Ammar’s mother, Umm Ammar, told me that her husband had stayed in Syria to care for his elderly parents. “He could not leave them on their own. Who would care for them if he left?” she said. The family of Umm Ammar are among the more than one million refugees who have fled across Syria’s borders since the uprising against President Bashar al-Assad’s regime began almost 20 months ago. In that time I have listened to the stories of the exiles in Jordan, Turkey, Lebanon and Greece. All have lost their homes and livelihoods and witnessed traumatic events. Yet all insist they will return to Syria. It sits in their imagination like an unbreakable promise. But with the war grinding into its second winter, she knows to temper her hope. In Lebanon, most refugees live in rented rooms or cram into the breeze-block huts built by the local municipality. The Lebanese state is determined not to allow large refugee camps. The country has been host to nearly 500,000 Palestinian refugees for decades and fears that the destabilising effect of Syria’s conflict is being carried into Lebanon. Across the valley we met a group of children – aged three to 12 – huddled around an open fire at another refugee shelter. The older ones tended the fire, while the youngest gathered twigs, paper, scraps of cardboard to pile on the blaze. A girl called Thumaya told me she had crossed the mountains with her parents and five siblings – including a four-month-old sister – several months ago. Her father had been wounded in Homs, and they had no choice but to flee to get him medical treatment. Crossing the mountains, they had to hide from an army patrol. I asked a boy standing at the fire what he missed most about Syria. “I miss the flowers,” he said. I was taken aback, expecting him to have spoken about his friends or the possessions he had lost. “Would you like to see the flowers?” he asked. When I nodded, he ran to one of the huts, returning a few minutes later with a collection of photographs. “That is me,” he said, pointing to a well dressed, smiling boy standing next to a bed of red roses in a Syrian garden. There was another photograph of a birthday table laden with cakes. That was a memento of a long ago birthday. The boy’s home and garden were destroyed by shelling. Late in the evening, I went back to see Umm Ammar. She had invited me to share the evening meal and stay with her family. I felt guilty eating their food but to refuse would have offended her deeply. “It is our tradition to welcome the guest,” she said. Exile and poverty would not change that. Here in the mountains, the dark comes swiftly and the temperature drops further. As I write, Umm Ammar and her five children are asleep on their mattresses nearby. The wind is battering at the flimsy wooden door and it is raining heavily. In the hut next door a baby is crying. A few miles away on the other side of the mountains men are killing and being killed. as families attempt to flee to safety. Tonight, as on every night, the uprooted of the war are on the move. RAMALLAH (Ma’an) — Palestinians in Israel’s Gilboa prison are protesting their transfer to a southern jail, a lawyer for the Palestinian Prisoners Society said Wednesday. The lawyer said Israel started transferring 37 prisoners from the northern West Bank to Nafha jail in the desert of southern Israel on Wednesday. Israeli authorities say the detainees are being moved so a section of Gilboa prison can be renovated to accommodate criminal prisoners, the lawyer said. The prisoners object as their families will have to travel further to visit them, and insist any transfer must be to another jail in northern Israel. They will return meals until Israel revokes the decision, and urged organizations and institutions to work to insist prisoners are held as close as possible to their hometowns, the lawyer added. Under international law, it is illegal for Israel to detain Palestinians outside Palestinian territory. A member of the Palestinian security forces is seen behind a flag in the West Bank city of Ramallah, where residents celebrated the return of Palestinian President Mahmoud Abbas from the UN General Assembly, Sept. 25, 2011. The attack of the masses on a Nahal Brigade infantry patrol in Hebron ahead of last weekend is not just another warning sign of the possibility that Judea and Samaria will soon start to burn: It is another manifestation of the fact that years of almost total quiet are reaching their end. Even more grave than the attack is the fact that is being exposed here for the first time: Palestinian security forces have stopped taking active measures against Hamas terror infrastructure in the last few days. The IDF is starting to survey the picture and begin to ready for the possibility that a new round of significant violence will erupt in Judea and Samaria during the first quarter of 2013. In order to understand to what extent this is a strategic shift in the situation, we need to go back a few years. Terror in Judea and Samaria effectively began to dissipate in the middle of the last decade as a result of operation “Defensive Shield” in 2002 and consistent IDF and Shin Bet activity at the heart of the casbahs [Palestinian old cities] and Palestinian refugee camps. Starting in 2008, a calm that was almost total prevailed over the territories. Palestinian security forces, supported by Israel and the United States, contributed to that fact, along with a clear order from Abu Mazen [Palestinian Authority President Mahmoud Abbas] and PA leaders — the choice of a political path as a route to achieving a Palestinian state, at the expense of a path of struggle. The Hamas takeover of Gaza Strip contributed most of all to cooperation between Israeli and Palestinian security forces: the common enemy was particularly strong glue between Israel and Fatah. The common interest in fighting Hamas is still relevant, but some things have changed for now. The disappointment of the Palestinian public over the fact that the political path didn’t actually lead to the establishment of a state led Abu Mazen to seek recognition of a Palestinian state on Nov. 29, despite the opposition of the United States and Israel (and only seven other states who opposed the move). At the same time, Abu Mazen began making speeches in which the “popular struggle” motif was prominent. He has recently brought Jibril Rajoub close to him, who in addition to his role as the head of the Palestinian Football Federation, has begun to organization protest activities against the occupation, which employ the strategies of the Ra’is [“president” in Arabic, a reference Yasser Arafat]. Against the backdrop of all of this, acts of popular terror have multiplied in the territories in recent times. The latest developments are also directly linked to operation “Pillar of Defense”: We can tell ourselves until the end of time that Hamas was dealt a “serious blow” and that the operation’s tactical objectives were achieved. From the perspective of a vast majority of the Palestinian public, Hamas won big-time. It achieved objectives including the cancelation of the “perimeter” (the strip of land 300 meters wide that lies west of the fence, which wraps around the Gaza Strip, into which Israel has forbidden entry since “Cast Lead”), and the partial lifting of the economic siege through the firing of missiles on the Israeli home front. The euphoria surrounding the arrival of Khaled Meshaal, for the celebrations marking the 25th anniversary of the organization’s establishment, only demonstrates its strength following the operation. On the other hand, Fatah, also in Judea and Samaria, is in trouble. The wider public is calling on Palestinian security forces to stop cooperating with Israel. The pressure will only increase in the near future, under the premise that it is necessary to realize the recognition of Palestine as the 194th state in the UN — in which it is a member. The decision of Palestinian security forces to stop acting against Hamas in recent days is not official, but is happening in practice. It is already being manifested in a halt to the arrests of terrorists (the IDF for its part is continuing to act against terror, all the time and everywhere). Hamas, for its part, has released Fatah representatives from its prisons in Gaza. This is against the backdrop of reconciliation talks between Fatah and Hamas, which will come at the expense of security cooperation between Israel and the Palestinian Authority. The bottom line is that the IDF and the Shin Bet believe that a new era is upon Judea and Samaria. How much will violence in the territories rise? Are we at the start of a third intifada? Not so fast, but the IDF has started to formulate operational and training plans ahead of the possibility that violence in Judea and Samaria will continue to rise in coming weeks and months. The objective will be to leave the Judea and Samaria sector as secondary as possible from a security perspective — but that’s not up to us alone. On December 11, U.S. President Barack Obama announced the U.S. now officially recognizes the Syrian Opposition Coalition as “the legitimate representative of the Syrian people.” Deputy Secretary of State William Burns restated the position while attending the “Friends of the Syrian People” in Morocco, adding: “the regime of Bashar al-[Assad] must and will go.” Burns announced U.S. plans to provide $14 million in humanitarian aid to help families in war torn Syria prepare for winter, in addition to another $50 million dedicated to civil society and opposition groups organizing against the regime. Delegates from the more than a hundred countries taking part in the “Friends of Syrian People” conference also made the unanimous decision to recognize the coalition and called on Assad to step down. The U.S. Department of State simultaneously designated all variations of Syrian rebel group al-Nusrah Front, as affiliates of al-Qaeda in Iraq (AQI), hereby adding them to the Foreign Terrorist Organization list. A teleconference transcript from senior administration officials provided an in-depth explanation for the decision, citing AQI connections, suicide attacks, and summary executions. In her daily press briefing, State Dept. spokesperson Victoria Nuland clarified what both decisions mean regarding how the U.S. will engage the opposition in the future. The Syrian Muslim Brotherhood called the decision “very wrong,” due to the “grey atmosphere” in the country, claiming that it is too early to categorize factions of the opposition. The Syrian National Council issued a letter opposing the decision, and many Syrians have called for protests, asserting that members of al-Nusrah have “provided for the basic needs of the Syrian people” and are the “revolution’s most effective fighting force.” Council on Foreign Relations released a piece on December 11, with differing opinions from Max Boot, Brian Fishman, Ed Husain, and AndrewTabler, on what U.S. policy should be in Syria. ‘I am the oppressed people. 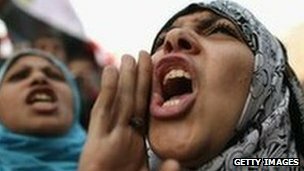 I want my rights, and I want to live with dignity.’ (Photo: flickr user Zadokite)Thousands of people have taken to the streets in Cairo in new rallies for and against a controversial referendum backed by embattled Egyptian President Mohamed Morsi. Thousands of Morsi’s supporters gathered at a mosque three miles from the presidential palace after busing in demonstrators from across the country. Meanwhile, thousands of protesters gathered outside the presidential palace to oppose Morsi and the planned referendum. In a potential nod to the opposition, Egypt’s government now says the vote will take place on Saturday as well as one week later. Egypt’s main opposition leaders meanwhile are now urging their supporters to vote “no” in the referendum instead of boycotting it. CAIRO — Syria’s neighbors have watched the nation’s civil war unfolding on their borders — and occasionally spilling over. Unlike Turkey and Iraq, Jordan has tried to remain neutral. There are signs the kingdom may be dragged, however reluctantly, into the conflict. With growing political and economic unrest at home, the last thing many Jordanians want is conflict with neighbor Syria. “The interests of Jordan dictate that Jordan does not interfere,” said political analyst Labib Kamhawi. He says those interests may come second to larger issues at play. “There seems to be enough pressure coming from outside, from the U.S. and Europe and coming regionally from the Gulf states and Saudi, using economic means to force Jordan to open its grounds for some sort of military intervention, be it human resources or arms or logistics — but it’s happening,” Kamhawi stated. The United States, a key Jordanian ally, has sent a small military contingent to the kingdom. Its precise mission is unclear. Damascus is just over 100 kilometers to the north and those trying to topple Syrian President Bashar al-Assad see Jordan as a key supply route to rebels trying to take the capital. “There has been some arms smugglers into Syria but really the minimum level. It is not enough to provoke the Syrians. But at least Jordan is giving the impression that it is ready to do it,” added Barari. The risk of Syrian retaliation was heightened earlier this year when Jordanian officials said they had uncovered an attack plot by militants from Syria. “No one can make the claim that the Syrian regime sent them, but once Jordan gets involved in this, this would be probably a front for Jordan to contend with,” explained Barari. As the Syrian government struggles for survival, a new threat has emerged. U.S. intelligence sources say Syria may be preparing to deploy chemical weapons. Political analyst Kamhawi says the U.S. hurt its credibility on such matters in the prelude to the Iraq war — which he feels casts doubt on the current claims. “If we accept the argument that there is some imminent danger coming from some Syrian chemical weapons, then this is an invitation for foreign intervention into Syria,” he noted. Both men feel that, regardless of what Jordanians want, ultimately it may not be their choice. “I think at the end of the day, Jordan will find it is really hard to take a position that is independent of what the Americans want to do,” said Barari. In the meantime, Jordanians are watching, and waiting.